The Viros Gorge is a sublime experience. Descending from the foot of Profitis Ilias it disgorges itself into the sea at Kardamili. Although the gorge is usually bone dry - in full spate the torrent is reported to be awesome and in winter flood it can threaten the bridge at Kardamili and low lying local houses. Further upstream around the Moni Sotiros the water is diverted into rather intrusive black pipes which supply the villages with water, which can run perilously low in high summer. For a sketch map of Kardamili and its environs including the Viros Gorge click here. The gorge goes through a number of defiles where the limestone cliffs tower above, stalactites hanging like lost wax from lofty caves and creating perches for birds nests. At intervals it widens out every so often into steep sided but wooded green valleys. There is a marked path but the going is poor with rocks and boulders dotted with Oleander bushes to negotiate - so those with a desire to wear high heeled patent leather sling backs may soon regret their decision. The occasional rock pool remains until May, seething with tadpoles, and the dry remains of waterfalls have to be scrambled over. There are signs of human activity in the caves and overhangs of the cliff walls and in the past these were probably fortified spots to which villagers would retreat when threatened by attack or lairs for particularly ascetic monks. Today these are mostly pens for animals or have fallen into rack and ruin. Keep an eye open for wild birds and animals but if my experiences are anything to go by you'll hear a host of avian chirrups, chirps and hoots (yes owls in daylight) but spotting our vocal feathered friends is another matter. a torrent bed, walled in by stupendous masses of rock: fragments of the cliff that had fallen from the precipice frequently interrupted our route." above them were the caves and "dwellings excavated in these rocks in situations almost inaccessible", here they were told the Maniates hid, "their property on the invasion of the Turks, or in their battles with each other". Their traverse of the gorge was accompanied by salutes of salvoys of musketry from other of Mourtzinos' warriors, "who had collected above on parts of the mountain to secure our passage." The journey, to Sibthorp's obvious frustration, failed to reach its intended lofty destination as, after six hours climbing and only two thirds of the way up Profitis Ilias, the party were warned that due to the snow at altitude and the lateness of the hour it was best to return to Kardamili. Sibthorp and his party dined under a rock. What they ate isn't recorded as, naturally, Sibthorp was more concerned with recording the plantlife around him. among the shrubs I noticed our gooseberry tree and the Celtis Australis grew wild among the rocks." From Kardamili take the river bed which soon narrows into a classic gorge. After a kilometre or so this opens out (just after a bank of cypress trees to the left of the gorge) into a verdant valley. There are paths going off to the right up towards Ag. Sofia but the real jewel of the gorge is hidden in the trees to the left, the monastery of Lykaki. A short scramble up the path into the trees the monastery is in a delightful sylvan location. The remains of the grass covered monastery buildings cling to the small katholikon of the Koimisis to Theotokou. According to Rogan the church was built in 1570 but the frescoes date from 1783, certainly their style is of that period and are rather stereotypical, though I could spot no dedicatory words which would confirm that exact date. I and others have not been able to figure out exactly what the name means - perhaps it is just the local name for the spot or perhaps it has something to do with wolves - Lykaki could mean 'wolf cub'. The church is in a parlous state and the huge crack over the door (on the south side) makes one worried for the future of the structure. The outside has little to note of intrinsic worth but the frescoes inside are vivid if extremely crudely formed - and in an almost complete state. For a long while there were only the remains of a door so keys were of no problem. This has changed and there is now a rather nasty and firmly locked door to the church. As yet I do not know where the key resides. No doubt the door will help preserve the frescos but one wishes that some sort of notice telling people where to find the key could be provided! The frescoes (though mostly only those on the first column) have been unfortunately used by locals to carve their names in for posterity. One resident of Kardamili said she knew who had perpetrated the graffiti but as the earliest scrawl is dated to the late 1800s it is likely that the practice has being going on for most of the last century and would point to there not being any monks in residence for many decades. The church is a compact two columned design with large painted columns supporting the domev (the warrior saints are depicted on the columns rather than, as is normal, on the side walls of the church). 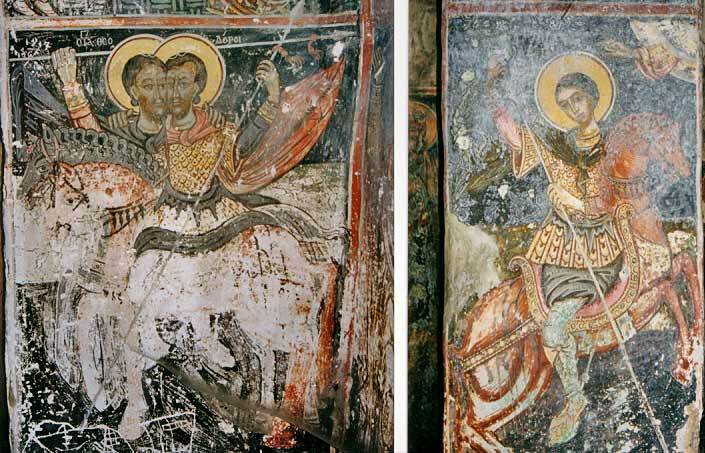 Nearly all the surfaces are covered with frescoes which are in a poor state of repair, the floor is beaten earth and the only furniture are a few dilapidated church-items and chairs. Some attempt has been made to brace the walls and ceilings with stout wooden beam. The frescoes tend towards the depiction of various marytrdoms and exquisite tortures being inflicted on saints by moustachioed characters with large scimitars, infernal machines and ropes - rather like those at Ag. Theodoroi, Kambos - and many other post Byzantine churches in the district which ties in with the date given by Rogan. There is a large Last Judgement dominating the west wall. As there is no west door (as is normal - the slope of the land obviating one here) the space that would have been filled with this is a depiction of the cross being worshiped by two saints or disciples. The Cross is resting on a series of bases behind which is the graphical depiction of a triple chambered church. Propped up against the cross are the spear and sponge on a wand of the Roman soldiers at Golgotha. The lance and sponge on a wand are repeated in the Crucifixion scene on the east wall where these items are carried by cavalrymen on particularly floppy legged horses. The style throughout is naive and curiously unaffecting and there is the odd sight of Ag. Demetrius seemingly riding his horse back to front which speaks volumes for the inept innate observational skills of the artist. That said there appear to be a number of styles and it is probable that a number of painters worked in Lykaki. The Iconostasis is of wood filled with rubble. The surface facing the Naos has completely lost its plaster and any paintings thereon. In the apse there are frescoes of saints. The woodwork (18/19th century) is, where it survives, intricately carved with animals and birds on the lower section and angels or cherubs on the upper rung. Any Icons which rested in the frames between these two carvings have long since gone. There are a number other outbuildings and a delightfully green and stagnant pool just below the katholikon. There are further buildings and the remains of a enclosing wall. The layout of these is best observed from the track that leads from Ag. Sofia high up on the southern wall of the valley. Further up again the river bed narrows into an impressive gorge with towering cliffs before opening out into another precipitous wooded valley. Where this valley starts to narrow again is the whitewashed monastery of Sotiros (Saviour) or the Metamorphosis, at Pogonitsa. Just above the dry river bed to the left, this is a larger affair than Lykaki and has obviously been used much more recently. I was told that few of the monasteries had been occupied since the troubles of the Greek Civil War (1945-49) which was particularly fiercely contested in this mountainous region but in fact many monasteries were closed down by the Othonian Greek government in the 1840s as they were seen to be a drain on the public purse of the nascent Greek state. For the thirsty traveller there is a tap on the wall to one's left as you reach the bottom of a flight of steps leading to the monastery's main platform shaded by mulberry trees. The church is firmly locked and I cannot report on its interior. According to Rogan the church was built on the site of a 14th century chapel and possessed a parchment Book of the Gospels. I did hear a story of how the book was stolen by some Italian art thieves, was later recovered, but is now safely ensconced in Kalamata, but cannot vouch for the veracity of the yarn. There is a mention of the monastery as far back as 1681 and according to an inscription on the side of the katholikon wall it was renovated in 1807. From Moni Sotiros the gorge continues deeper into the Taygetus - I have gone no further but have read that it gets progressively more difficult to traverse and from above it is obvious that it gets much steeper. 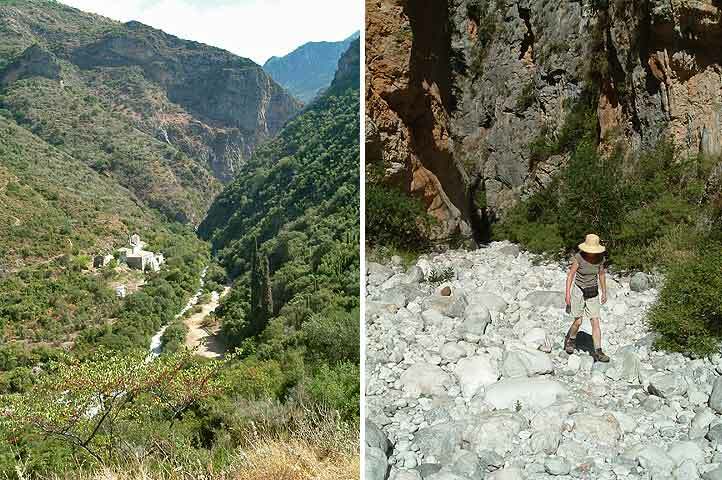 At the Sotiros monastery paths go up either side of the gorge. The one up the north face of the gorge (via the gate at the top north western corner of the monastery enclosure) is extremely steep, overgrown and, in places, difficult to follow but you will eventually haul yourself (sweating profusely and covered in twigs if one unfit 40 something year old is anything to go by) up into the tiny village of Pedino from whence better tracks lead either seawards or up to Tseria. 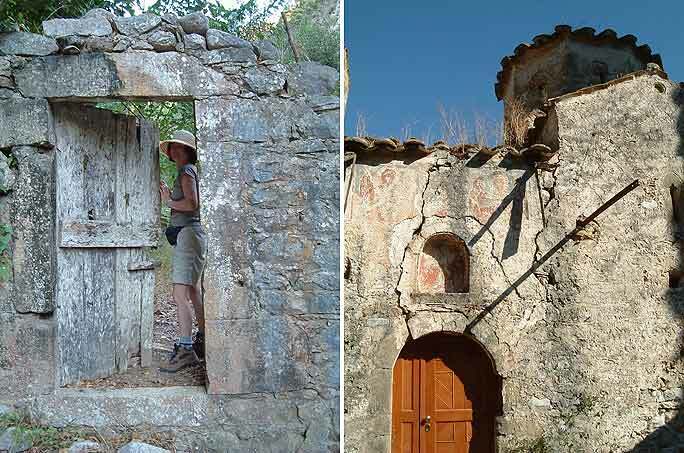 I have heard that on the feast of theTransfiguration or Metamorphosis on the night of 5/6 August villagers from the villages troop down this goat track and spend the night carousing at the monastery on the only day of the year when the church is open. To the south side of the torrent a well made track/road leads by a series of hairpin bends up onto the heights above the gorge. Near the top of this a small but discernible marked path (in parts a rather good kalderimi) climbs up to the east and to a chapel perched on a bluff and the village of Exohori to which it belongs.